Unravelit Reviews: The Best Gas & Electricity Comparison Site? 1. What Do You Want To Compare? Unravelit is a very simple website with a no frills approach to energy price comparisons. 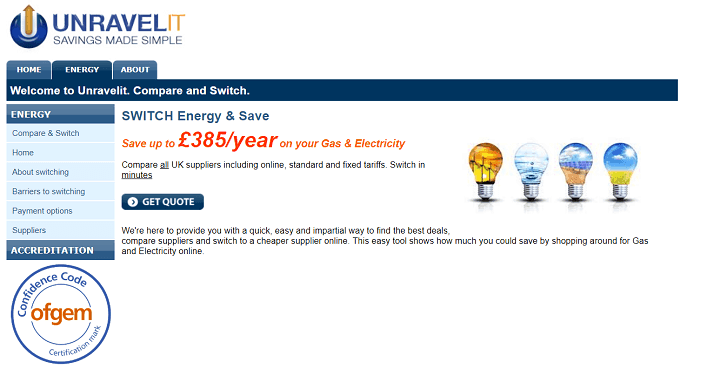 Unravelit offer to save their customers up to £385 per year on gas and electricity and state that they compare all UK suppliers. They are accredited by Ofgem under the Confidence Code which means that they offer unbiased comparisons that are transparent and fair. They are fully independent and a no obligation service. There are no reviews of the company that we could find online. Unravelit keep their prices up to date by being a Consumer Focus accredited member and they monitor tariffs on a continuous basis to ensure their website is always accurate. They are paid a small commission by some of the suppliers they use, but this does not affect how they present their data. Customers are free to choose whichever tariff they want. The website offers minimal information in addition to the comparison service. This includes information on how the switching service works and barriers to switching that are experienced by some customers including people thinking it is too complicated or not trusting the system. They aim to refute these claims with an article that explains just how easy it is. They also detail payment options when it comes to energy bills and how a degree of flexibility is now coming into the market. They recommend a monthly direct debit as this can result in lower prices overall. This comprehensive section details all methods of payment and the advantages and disadvantages. Finally they list the suppliers they work with and those who offer commission.many of these suppliers can be clicked on to get further information to allow the customer to make a more informed choice. Unlike others in this industry, this company offers very little additional information and does not seek to reassure customers regarding complaints procedures or their approach to transparency. However their Ofgem accreditation does set them apart. Unravelit is mentioned in an article by The Energy Shop where comparison sites were checked for their methodology and if they were misleading or inflated. It was part of the study, but was not highlighted as being one of those that has stood out as unusual. There is very little to go on with Unravelit. The website is very basic and old fashioned with a clunky interface. The information from the company or about them is scarce and they do not have a presence on review sites. This all makes it very hard to gain a clear idea about how they work. However, they appear to be very straight forward with a no frills approach. Want a Better Energy Deal? Top 11 Ofgem Approved Energy Price Comparison Sites: Which Is Best? Switching Business Energy Suppliers: How to Find the Best Deal? Note Power Compare is an information website only. We are not an energy supplier, generator or broker. We have partnered with uSwitch to provide home / domestic energy comparison services and Love Energy Savings for business energy comparison services. Both are 100% free to use, but pay us a commission if you use them to switch your supplier.